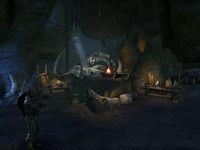 This article is about the crafting site in Grahtwood. For the abbey in Cyrodiil, see Abbey of the Eight. The Temple of the Eight is an old temple in central Grahtwood, northwest of Elden Root. The temple is home to a special crafting site, where you may craft items in the Armor of the Seducer set. It is guarded by the Brackenleaf's Briars, and an Orc named Agstarg resides within the Divine Sanctum. A Brackenleaf shrine can also be found just outside the temple exterior, and will confer a blessing upon you if you have completed the quest Bosmer Insight. During the New Life Festival event, an Altmer priest named Ormurrel can be found here. War Orphan's Sojourn: Celebrate the New Life Festival with the Altmer of Haven. This page was last modified on 16 December 2018, at 13:00.